More often than not, we go to a neighborhood and see neatly trimmed grass and decorative plants in the entryway. The book definition of a manicured lawn. Is it pretty? Yes! Is it useful? Not in the slightest. In fact, lawns massively contribute to global warming and environmental pollution. If you are a gardening enthusiast, this might cause you a cognitive dissonance. How is this lovely grass you nurture detrimental to the environment? Keep reading to find out the answer to this question; and to learn about how you can still do gardening through an excellent, environmentally sound practice: growing a food forest. Current lawns take inspiration from the English landscape gardens, which became popular in Europe in the 1700s. The English gardens "usually included a lake, sweeps of gently rolling lawns set against groves of trees, and recreations of classical temples" (Wikipedia). They were a sign of aristocracy, as the landowner could afford to maintain unproductive land. Fast forward to last century, after the second Industrial Revolution brought along industrial suburbs. Well-kept lawns "propagated the homogeneity of the suburb itself" (Wikipedia). They were signs of good citizenship and increased the selling price of new homes. Today, manicured lawns are part of urban and suburban culture around the world. However, the Great Recession and increasing environmental concerns have made people dig up their gardens and start planting vegetables. People in the cities use 50 to 70% of available fresh water in their lawns. These resources inevitably end up polluting water sources because wrong timing and application generate excessive runoffs. People use more chemical fertilizer and pesticides to maintain an acre of lawn than they use for one acre of cultivated farmland. Manicured lawns are biological deserts. Now, let's move on to what really matters: our food forest. A food forest is "a gardening technique or land management system, which mimics a woodland ecosystem" (Beacon Food Forest). It is a productive forest garden and consists mainly of edible trees, shrubs, perennials and annuals; all of which work together to make this controlled ecosystem more than the total sum of its parts. So, while a food forest is not natural —because we made it happen—, it has the biodiversity and productivity of the ecosystem it imitates. 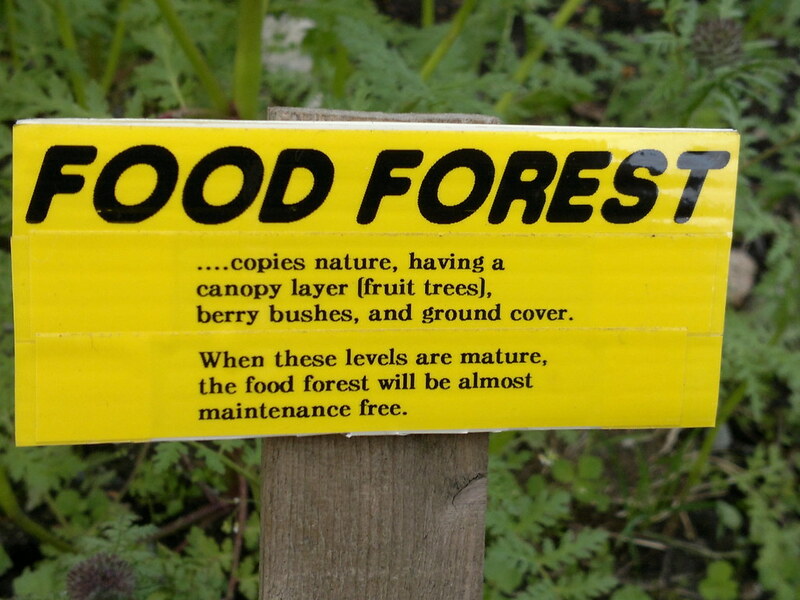 WHAT ARE THE BENEFITS OF KEEPING A FOOD FOREST? A food forest is typically planted in layers of different types of plants, thus ensuring you maximize your land use; as a result, a food forest will give you high yields. Furthermore, the rich biodiversity will grant you with continuous food supply throughout the year. Food forests, akin to natural ones, are self-mulching. This means that they can enrich their soil with decaying leaves, bark or compost they produce. But this is not a surprise; in food forests, there's plenty of fallen leaves to go around for all the decomposer insects that help out natural composting processes. Your food forest will not require fertilizers and pesticides the way your vegetable garden does. Why? Because this ecosystem is home to predatory insects (the good bugs) that thrive in the abundant food sources the food forest can provide. Furthermore, this lively environment attracts birds and other predators, which are a form of natural pest control. Think of monocultures as a thing of the past. Nature grows an assortment of different plants in the same area, so they can benefit from each other. This closeness creates a natural synergy which makes plants grow better. This makes plants more resistant and more productive (more food for you). This practice, called companion planting, is one of the pillars of permaculture and forest gardening. It allows you to recreate nature's biodiversity and reap all its benefits. Your forest garden is essentially self-sustaining; therefore, you don't really need to do much to the soil. If the life cycle of your annuals ends, do not uproot them, just chop them at the root and drop the them on the grown. Their rotting roots create pathways in the soil so the air and water can find their way to other plants. Finally, the part you chopped makes an excellent floor buildup for compost. Overstory tree layer (canopy layer): Consists of original mature fruit and nut trees which absorb the mayority of sunlight because of their height. Think of mango, avocado and nuts. Understory tree layer: Sits underneath the canopy layer and consists of smaller fruit trees on dwarfing root stocks. E.g. coffee and olives. Shrub layer (bush layer): It sits beneath the understory and is ideal for berries, currants and similar plants. Herbaceous layer: It fills the remaining space and along with the shrub layer, can produce both anual and perennials. Here is where you find the culinary and medicinal herbs, companion plants, etc. Ground cover layer (horizontal layer): This layer is very important, as it protects the soil from erosion, reduces water evaporation and dimishes weed growth. Root layer (rhizosphere): It is useful for both food production and soil life creation. The root layer creates pathways for water and air which gives life to the soi. Vine layer (vertical layer): Our food forest is a three-dimensional space, hence the need to fill the upright vertical space. We can do this with climbers and vines, such as grapes, climbing beans and peans, passionfruit, kiwi, etc. For further information on how you can make your food forest happen, please take a look at our fruit forest and feel free to join us in the Climate Change Activist program.